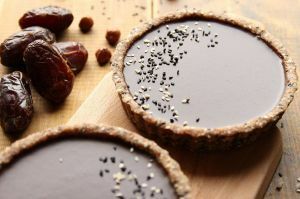 With Passover just around the corner, I knew it was time to start working on a vegan version of one of my holiday favorites! 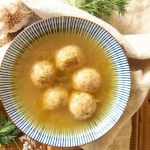 Kneidlach, or matzo balls, or to be precise, vegan matzo balls! Since my motto has always been “anything you eat I can make vegan and eat too”, I set off and began experimenting, determined to succeed. And I did! After much testing and retesting, I ended up with what in my opinion is pretty close to the real deal, and that makes me very happy. Every year, just before the great Passover meal, I remember my Grandma-in-law in her kitchen, cooking away. She would cook an entire meal from entrees to dessert all by herself. It was her passion! As the years past, she began asking for help, and I happily agreed. The chance to see up close how she made everything fascinated me, plus I’m always up for quality bonding time. I would always prepare the fruit salad since she was amazed at how fast I would chop all the fruit. I would also wash the dishes and help her roll an enormous batch of matzo balls. Every year we would begin by counting the matzo balls as we dropped them into the soup, and every year we would somehow forget how many we rolled. Today my Grandma-in-law isn’t with us anymore, but when Passover is near, and I’m in my kitchen rolling my own vegan matzo balls, I’ll automatically be reminded of her and cherish those memories spent together. 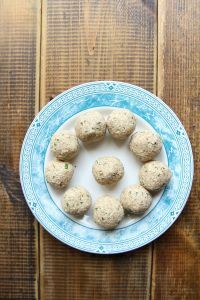 As for these vegan matzo balls, they are trickier than egg-based ones, but I have tested and retested this recipe and can say with confidence, that if you follow each step, your matzo balls won’t fall apart. Happy Passover to all those celebrating! First, prepare your soup. Chop the veggies, add to the pot, season well, add water, boil until soft then place the pot on the lowest heat possible. It’s important that the soup doesn’t boil or simmer, or your vegan matzo balls will fall apart. You just want the soup to steam. 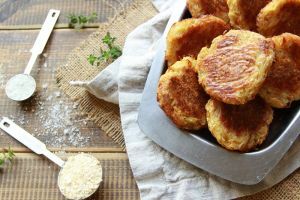 To prepare the matzo balls, place the matzo flour, baking soda, potato starch, sea salt, black pepper, garlic powder, freshly diced dill, and the liquid from a can of white beans into a bowl and mix until combined. 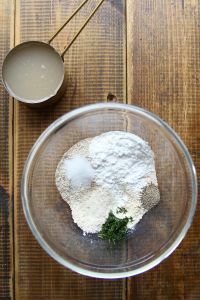 The mixture will look very wet, that’s perfect, see picture below! Transfer to the fridge to chill for 20 minutes. Take out of fridge and roll 20 balls, wetting the tips of your fingers when needed to prevent the matzo balls from sticking to your fingers. Next, gently pop them into your pot of *soup. Put your timer on for 20 minutes and leave them alone to gently cook with the lid open. Occasionally check in to see that the soup isn’t simmering. 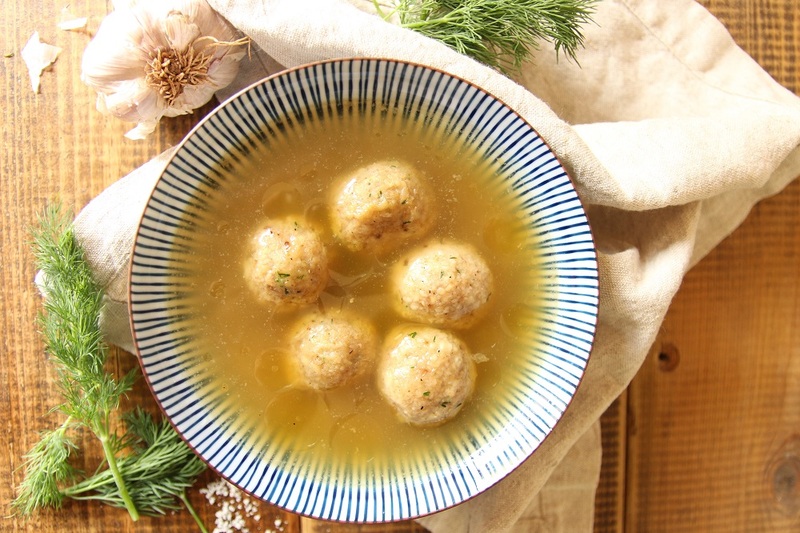 *It’s important to cook the matzo balls in the soup because it gives them flavor, without it you’ll just be left with a ball of matzo flour and seasoning, that doesn’t necessarily taste bad, but doesn’t taste amazing either. After 20 minutes, gently scoop your vegan matzo balls out of the soup and transfer them onto a plate. When you’re ready to serve, first heat the soup on its own, then lower the heat and add the matzo balls for a few minutes to let your vegan matzo balls warm up. 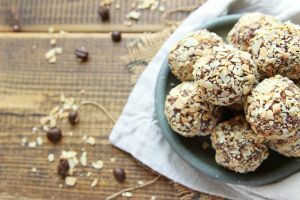 Vegan Matzo Balls That Don't Fall Apart! Chop the veggies, add to the pot, season well, add water, boil until soft then place the pot on the lowest heat possible. It’s important that the soup doesn’t boil or simmer, or your vegan matzo balls will fall apart. 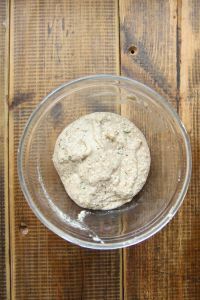 Place the matzo flour, baking soda, potato starch, sea salt, black pepper, garlic powder, freshly diced dill, and the liquid from a can of white beans into a bowl and mix until combined. The mixture will look very wet, that’s perfect, see pictures above! Transfer to the fridge to chill for 20 minutes. Take out of fridge and roll 20 balls, wet tips of fingers when needed to prevent matzo balls from sticking to fingers. Gently pop them into the pot of soup. Put your timer on for 20 minutes and leave them alone to gently cook with the lid open. Occasionally check in to see that the soup isn’t simmering. 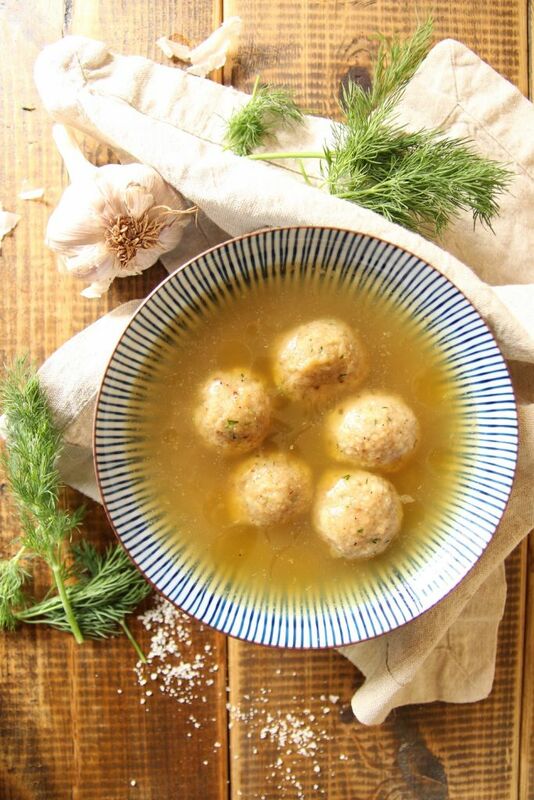 When ready to serve, heat the soup on its own, then lower the heat and add the matzo balls for a few minutes to warm up your vegan matzo balls. 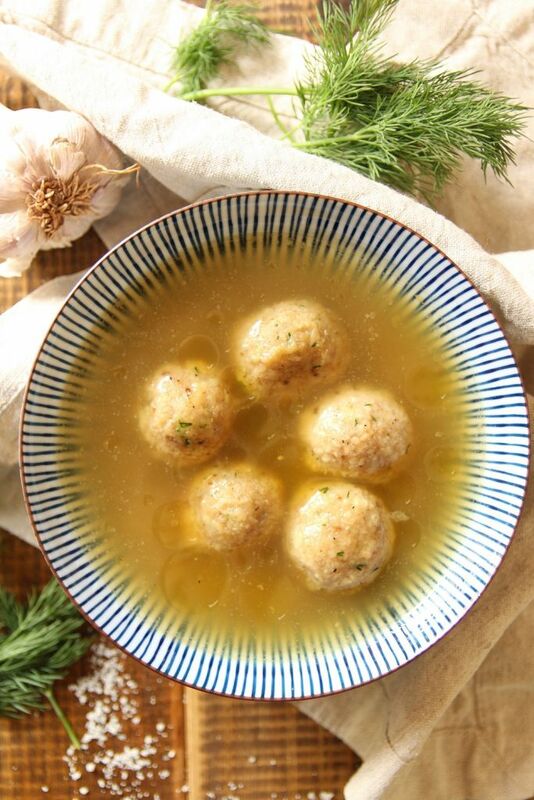 It’s important to cook the matzo balls in the soup because it gives them flavor, without it you’ll just be left with a ball of matzo flour and seasoning, that doesn’t necessarily taste bad, but doesn’t taste amazing either. 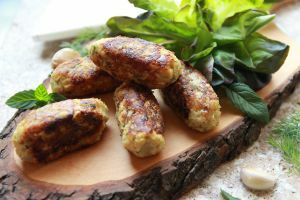 You may also like to make one of the following recipes for your Passover meal.